Make a Perfect Circle. WITH a TABLE SAW! There seem to be a lot of squares in this world, especially in wood working. The problem is, sometimes you just need a circle. "But I don't have a circle dispenser!" you might say. Who needs another bad band saw cut circle. Your table saw is all you need. Step one: Don't shoot your eye out. Ok, so maybe step one is don't cut your hand off, but eye protection is a good idea too. 2) Some old junk wood including at least one piece of plywood and some pine or other dimensional lumber. 3) Some cut washers and flat head screws. 4) A drill and some drill bits. Warning! If you woke up this morning and at a full bowl of stupid, or generally thought to yourself, "Hmmm... I have too many fingers," DO NOT TRY THIS AT ALL! (I don't care if your at home or not!) No, but seriously, if you cut your hand off or lose an eye don't come crying to me, that's what your mom's for. For everyone else, proceed to the next step. Step 1: Get Jiggy With It! The key to making this whole thing work is the jig. Most table saws have a channel guide in the table top. We're going to use this guide to hold your circle cutting jig. Your plywood will serve as the table top of your jig. I used a .5 inch thick scrap I had laying around. You can use different thicknesses, but if your jig is too thick your table saw blade may not cut deep enough if your making thick circles. Every table saw is a bit different, my measurements won't be the same as yours. You want your table top to be about .75 to 1 inch away from the blade itself. From there, just cut your plywood the same size as your table saw top. It doesn't need to be perfect, just a rough size estimate. Step 2: Get Your Groove On! The next thing you need, is a piece of wood slightly narrower and flatter than the channel in your table saw. Cut your dimensional lumber or whatever you chose, to the right thickness to fit in your channel, (for me 1"x2" pine fit nicely) next, place your piece in the channel and draw a line along the length of it. Cut this down slightly flatter than the channel is deep. Finally cut your piece to the same length as the channel itself. Attach your fancy shmancy new guide piece to the jig top using glue and screws. Make sure your screws don't come through the other side of your jig top. You could also nail this piece on with a pin nailer. Step 3: Washers! But Not the Clean Kind. Grab them washers! Make sure the washers you have are not too large to fit into the channel. Mine were a bit undersized, but I used what I had laying around. If you shop around a bit you may be able to find some that fit perfectly. Attach the washers to the guide piece with flat head screws. You can use any type that taper from the head to the threads, but it's important to pick screws with heads not much larger than the diameter of the hole in your washers. If the heads are too big you might have problems with the heads grinding in the channel. Also, make sure again that the screws don't poke through the other side. When you mount the washers, you want them to spin freely on the screws but not wiggle. Space them over the edge of your guide only a tiny bit. The first time I tried this I spaced the washers too far over the edge and they wouldn't fit in the channel. Check out the pictures for a better idea. Step 4: Bust Out That Tape Measure. To make a circle you need a center point. Measure from the blade to a point half as wide your circle. (Hmmm that's confusing) What you're measuring is the radius of your circle. So for instance, I wanted to cut and 11 inch circle so I measured 5.5 inches from the blade and marked that point. Another note! Make sure you're measuring a perfect 90 degree angle from the blade. If your measurement is crooked, your circle will be smaller than you want. Grab a screw or nail that is slightly longer than your jig top is thick. You want it to poke out enough to dig into your circle a little bit. Drill a hole where you marked your center point, and put the screw through from the bottom to the top so the point just pokes out. Another tip! I like to write the points make. That way if you need another circle the same size later on, you can use the same hole. That's it! Once your screw is in, your jig is done! Grab a board and start slicing away! It's a good idea to take the corners off first then continue cutting off all the high spots. OH YEAH! 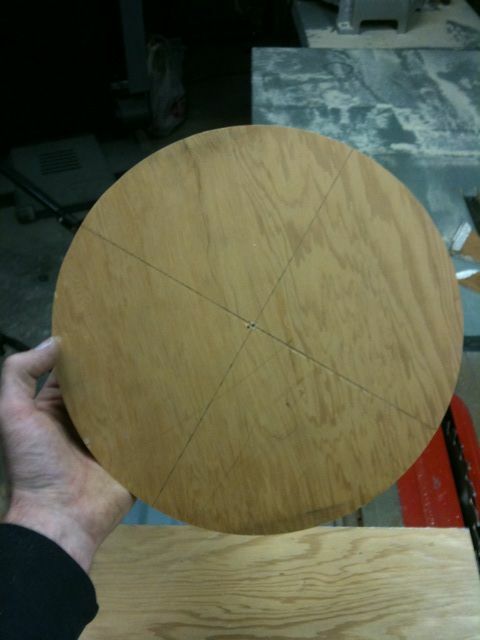 On the safety side of things, make sure when you're cutting larger pieces off your circle that you cut straight lines. In other words, don't try to spin the circle till the very end! This could result in loss of limb, or worse yet, loss of circle! To cut the circle try adjusting the blade to just touch the wood to cut and turn 360. Then raise the blade a little bit and cut again. keep raising and cutting till though to the top. Very nice! Who would have thought you could make a circle from a square - and with humor! nice work! great first instructable. welcome!